Clear ambition in the Valleys. “A lot of fabricators have attempted to move into glass manufacture but then start to buy-in again. We have done it the other way round and for my money, the right way round. There are fewer processes in PVC-U frames, in comparison glass is far more difficult to work so the transition is harder, going from glass to glass and frame manufacture is more logical”, says Jeff Edwards. He set up Glamorgan Glazing in 1989 aged just 16 with a £5,000 loan from the Prince’s Trust. Three decades on, the company is one of South Wale’s largest glass IGU manufacturers and has a cutting edge manufacturing capability. The group’s operation is split across two sites, its state-of-the-art glass processing plant and just a stone’s throw away, an even more impressive 28,000 sq ft PVC-U operation. What is staggering is that this cavernous manufacturing capability, filled with the latest machinery was only set-up in July last year. “When we started I said to the boys, ‘I don’t care if we only make 10 windows but I want to make them well’. That week I don’t think we even made 10 windows, we might of made one window 10 times”, Jeff quips. There is an ease and confidence about Jeff and the Glamorgan Glazing team. The company continued to grow and invest throughout the downturn, totalling a more than £4m spend on equipment, machinery and stock. But this belies a very definite focus on quality, efficiency and productivity. This starts with the company’s choice of system. The Ideal 70 from aluplast is an energy efficient five-chambered fully sculptured profile from a global leader in PVC-U technology. Manufactured by aluplast specifically for the UK market, the German-engineered system is designed to deliver a host of manufacturing efficiencies. This includes an optimum 44mm flush triple-glazed beading option, which contributes to up to a WER A++ rating. Fully integrated hardware and appropriate reinforcement, also make it a proven Part Q, PAS24:2012 and Secured by Design system. “The energy efficiency rating was important – it’s a priority for end users. The ecotech 70 aluplast’s recycled content system also gives us something a little bit different” says Jeff. The technology used by aluplast to manufacture the ecotech Ideal 70, exemplifies the investment the systems house has made in its offer. It simultaneously uses two compound screw feeds, which push recycled composite and virgin material simultaneously through a single dye to create the profile. This locks recycled material away from areas of the frame visible to the end-user or which perform a structural role. Its use of Calcium organic stabilised virgin material on all surface extrusions, means that aluplast is able to guarantee the surface performance of profiles, including consistent depth of gloss. “For us it’s about the manufacturing efficiencies. We operate a lean manufacturing system in the factory and keep our overheads very low, which means that we can pass on the savings we make in a very competitive price point to our customers”, says Jeff. This is key to the Glamorgan Glazing offer. It has exploited efficiencies in lean manufacturing, in machinery and in its choice of system. It’s passing on the benefits that this delivers, plus the advantages of single source supply to installers. Jeff concludes: “Say for example you have a mis-measure – we know they do happen. 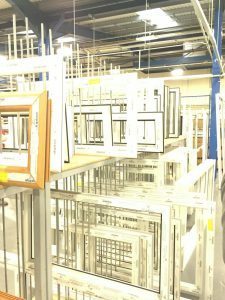 If you’re buying in from a fabricator with a conventional set up buying in glass, even if you can get the frames remade, you might have to wait for a week or more to get the glass and get out and complete the job. “It’s not just the cost of the replacement frame or glass, it’s the time going back to finish the job and being able to invoice – it can represent thousands of pounds on your cash flow. To find out more about Glamorgan Glazing window and door offer visit www.glamorgan-glazing.com call 01639 822252 or email sales@glamorganglazing.com . For more information about becoming an aluplast customer, call 01684 273401 email orders@aluplast.co.uk or visit www.aluplast.co.uk.